Manage the hyperlinks in your Word document and check for accuracy. If you are writing a report, which has a lot of hyperlinks then checking them for accuracy can be quite a task. 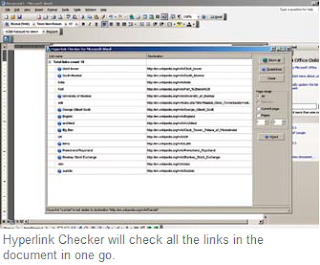 Instead of manually checking each hyperlink, you can download the Hyperlink Checker for Word. It can be downloaded form http://www.ablebits.com/word-hyperlink-manager-addins/index.php. Once installed start Word 2003, right click on the toolbar and check on the Ablebits.com toolbar. In the toolbar click on the Hyperlink Checker button, it will instantly check the documents for the hyperlinks and display the result. Although it doesn’t check if the link is active, it basically connects the linked word to the website or document name. This way you can make sure that you have linked the right word with the right website without manually going through every hyperlink in your document.